Hike lush rain forests, howl with howler monkeys, relax with a sloth, sing with birds, and investigate millions of insects during your tour of Corcovado National Park in the Osa Peninsula,Costa Rica! Corcovado National Park is famous for holding 3% of the biodiversity on this side of the planet. > Click here and Book your Corcovado Tour now! Famous for being–the Amazon of Costa Rica—the Corcovado National Park is the largest stronghold of primary forest on a Pacific coastline, and is famous for being “the most biologically intense place on Earth”. Be prepared for a thrilling tour as you explore some of Mother Natures most amazing works of art. The area holds thousands of species of flora and fauna, many unique to the area and others which have disappeared from other regions, or are in danger of extinction. Approximately, 6,000 insects (including the 123 different butterflies discovered so far), 500 trees (a fourth of all the tree species that exist in Costa Rica), 367 birds, 140 mammals, 117 amphibian and reptiles, and 40 freshwater fish species live here in coexistence. 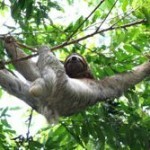 Immerse yourself in life’s wonders with the BEST Costa Rica Nature Tour. The Corcovado National Park Full Day Nature Tour departs from Punta Uvita at 7:00 AM and arrives approximately 1 ½ hours later at San Pedrillo Ranger Station in the Corcovado National Park. Upon arrival you will prepare for two guided nature tour hikes along two different trails and observe beautiful flora and fauna. Each hike takes around 2 hours. During the hikes you will be able to see many mammals such as spider, howler, and white-faced monkeys, sloths, coatis, raccoons, and tapirs as well as a great variety of birds, plants, and trees with over one hundred years of existence and in danger of extinction. After the first hike, we serve a picnic lunch near the San Pedrillo ranger station and then we begin the second trek. During boat transit from Punta Uvita to Corcovado National Park you may observe whales, dolphins, turtles, marine birds and fantastic views of the southern pacific coast of Costa Rica . The boat returns from Corcovado National Park at 2.40 pm and arrives to Punta Uvita beach at 4:00 p.m.
>> Click here and Book your Corcovado Tour now!